Prehung doors come in standard heights and widths. This is fine for the majority of doorways, but on occasion a doorway may be too short for a prehung door to fit in the rough opening. The door jamb and possibly the door have to be cut to fit. Doing this without ruining the door jamb or causing it to fall apart can be a little tricky, but a few tools and some know-how get the job done. Lay the prehung door face down so the hinges are up. Place the point of the screwdriver against the bottom of a hinge pin and tap it with the hammer to remove it. Remove all the hinge pins. Remove the plastic bolt and nut that hold the latch jamb to the door for shipping. 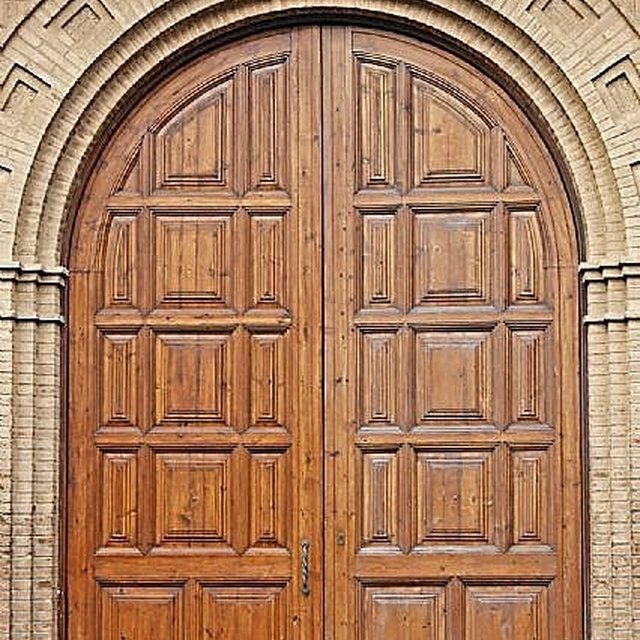 Remove the door from the jamb and set it aside. Measure and cut two pieces of two-by-four to a length of 2 feet, using a tape measure and circular saw. Clamp each piece to the top of a sawhorse, parallel to the top and hanging off the end 8 to 10 inches. Measure the space between the two side jambs along the top jamb. Measure and mark a piece of two-by-four for a spacer and cut it to this length with the saw. Clamp the spacer between the side jambs approximately 12 inches from the bottom ends of the door jamb frame to stabilize it. Lift the jamb and place it so one side jamb rests on top of the two-by-fours clamped to the sawhorses and the other hangs below them. Measure from the bottom end of the side jamb the amount you wish to cut off and mark the jamb with a pencil. Draw a line across the jamb, using the square as a guide. Cut across the jamb with the circular saw. Turn the frame over and repeat this for the other jamb. Remove the door jamb from the sawhorses and place it face-down with the hinges up. Set the door on top of the jamb and align the hinges. Insert the hinge pins and tap them into place with the hammer as necessary. Insert the plastic latch shipping bolt and nut. If the door will require cutting, cut the door before reinstalling it in the door jamb. By stabilizing the door jamb, it won't fall or twist apart while you're cutting it. When you are cutting the jamb, be prepared for a slight increase in the drag of the sawblade when you start cutting the door stop. You may also hit a small brad nail or two as you cut through, which may cause a harmless spark. Wear safety glasses and understand the safety instructions for your circular saw.